Given the proliferation of information and the lifelong importance of information literacy and critical thinking skills, librarians need to know how to best design information literacy instructional materials in order to help students locate, evaluate, and use information effectively. This poster builds upon an experimental research study conducted to determine how instructional materials designed using the I-LEARN model could increase student understanding and application of information literacy concepts. 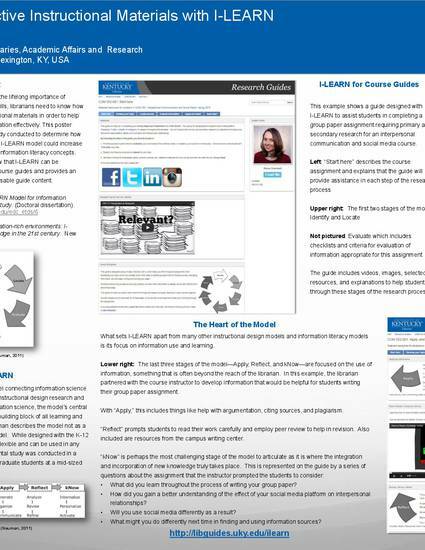 The findings from the research study show that I-LEARN can be particularly valuable in designing online course guides and provides an easy-to-use framework for developing reusable guide content. A poster presentation at the American Library Association Annual Conference 2015 in San Francisco, CA.